We have heard or even seen the news about the live marriage proposal of Dingdong Dantes to his long-term girlfriend Marian Rivera and the media even coined it as "The Royal Engagement". The intimate proposal of Senator Chiz Escudero to Heart Evangelista , the YouTube sensations and real partners known as JaMich, wherein Paolinne Michelle “ Mich” Liggayu proposed to her cancer-laden beau Jam Sebastian. 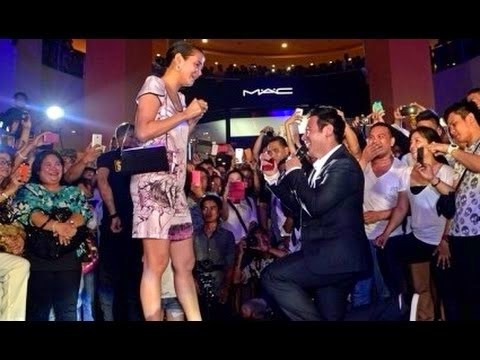 There was also the most-talked about marriage proposal of John Prats with a flash mob to Isabel Oli and Chito Miranda’s grand romantic proposal to his tearful girlfriend Neri Naig. Because of these celebrity proposals, it inspired even locals to make their marriage proposals to be very creative and sensationalized too. In short, it is becoming yet another trend. Yes, it is fun and romantic! The mere fact that it is a memorable once-in-lifetime event; of course one really wants it to be perfect and successful. And yet, we just have to make it crystal clear that a marriage proposal should be taken with responsibility and not because it is a trend. It is not just a ring on a finger, not just making your partner happy for bringing to life their girlish dreams of having a fairy tale-like love story. It is not just about the creativity behind it, the flowers, the people, the venue or how you do it. It is way, way beyond that. You have to be certain that you yourself (who will ask the hand of your partner) are ready of leveling up your relationship into a more serious state of being engaged and eventually leading to marriage. It is a lifetime commitment that doesn't have a reset button. Once you pop the question, it means that you want to share your life with the “one” and will share the responsibility of its ups and downs no matter what. That means, you are on it 100% emotionally,physically, spiritually, mentally and even financially. And of course, you also had considered your partner’s readiness, too. Just like a lawyer, you shouldn't ask a question unless you know the answer. You have to make sure that your partner already hinted of having you as her husband. And that her heart is on that track of getting married. Always check her priorities because when she finally says “yes,” that means she is prepared as well to give up some of her priorities and to give in to you as her soon-to-be lawful husband. So before you drop yourself in one-knee and to gaze lovingly while you flash that ring to your girlfriend and ask the question, you should have considered the overwhelming twists and turns of events and the responsibilities that go with it,once you did...then go ahead and make her happy!